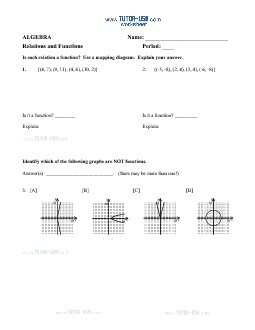 This free algebra worksheet contains problems on functions and relations. Students must use mapping diagrams and the vertical line test to determine if a relation is a function. Students must also graph functions using a table and set of points. Coordinate planes are included for graphs. 8. To determine if relations are functions by applying mapping diagrams and the vertical line test. Is each relation a function? Use a mapping diagram. Explain your answer. Identify which of the following graphs are NOT functions. Is each relation a function? Use the vertical line test. Explain your answer. D. a linear function Graph each equation using a table and a graph.